Realizing that many of the visitors seem to be headed towards left of the main palace, I did the same. There I came upon Sujeongjeon. Another grand looking and colourful palatial structure. This entire building was used as the King’s bedroom in it’s time. 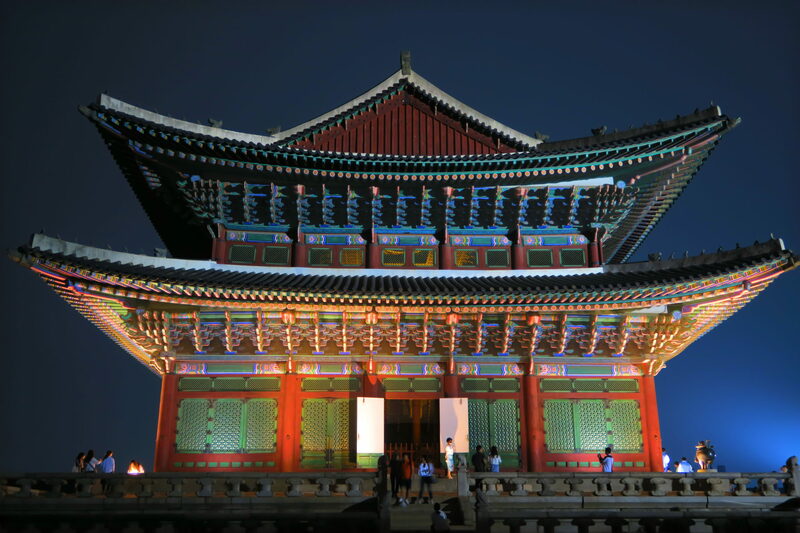 It was also during King Sejong’s reign (1418 to 1450) that in one of his inspired moments, he developed the Korean Hangul writing system right here. 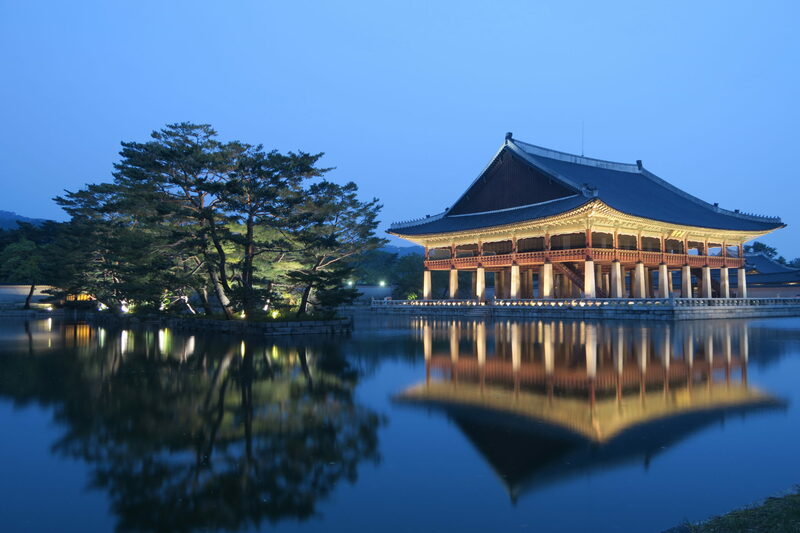 That period is famously known as the Golden age of Korea. Tonight, it appears that it has been turned into a stage. Flanked on both sides by colourful drums, they were also starting to put seats at the front. I am guessing it will be completely filled when the show starts. As it was almost dark,it can’t be far away now. Figuring I have yet to explore the grounds fully, I walked round the back of this building and came to a lake. 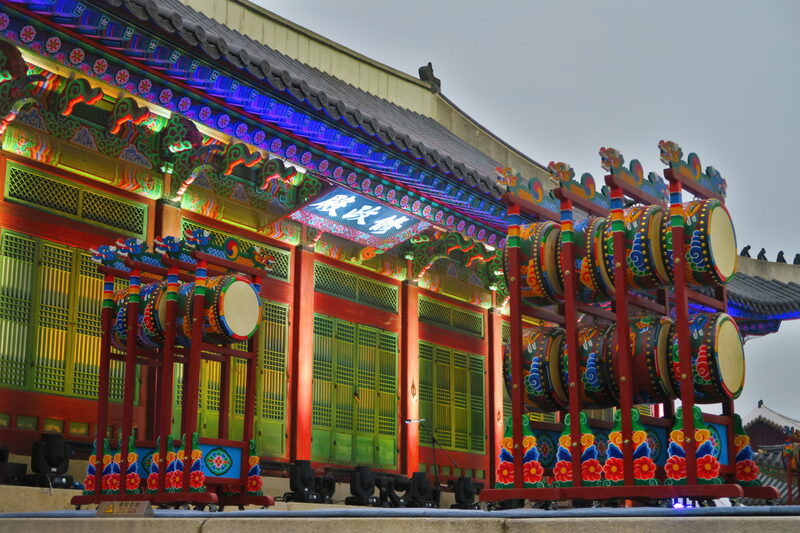 Resting on it is spectacular Gyeonghoeru! 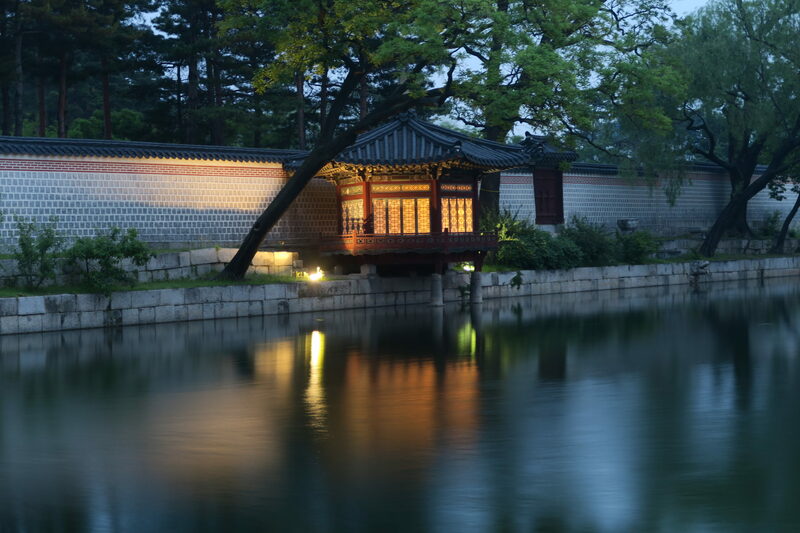 Registered as a National Treasure, this pavilion is used to hold special banquets during the Joseon dynasty. And in summer, Kings and his royal entourage would go boating. Built on a man made lake, it is strikingly beautiful with its mirrored reflection. There were many photographers all lined up for that perfect shot as the sun set but I reckon you can’t really go wrong here. Any shot would be postcard perfect. I easily took dozens myself. I walked further round the lake and took a few more photos from different angles when I heard music started to come from Sugjeongjeon. The show had begun! So, I quickly made my way back and as expected all the seats were full and there was only standing room only. By this time, I was beginning to regret not getting something to eat earlier. I was getting hungry! 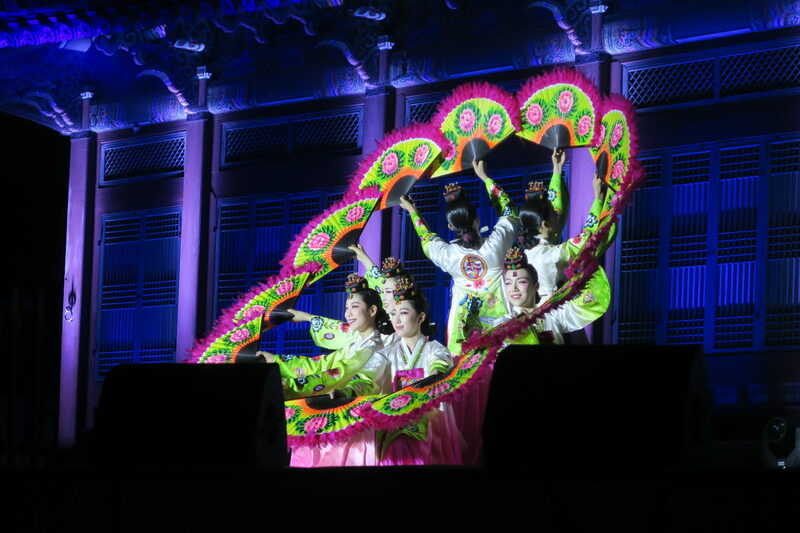 And then the show started with dancers filling the stage in what appeared to be a local Korean dance. 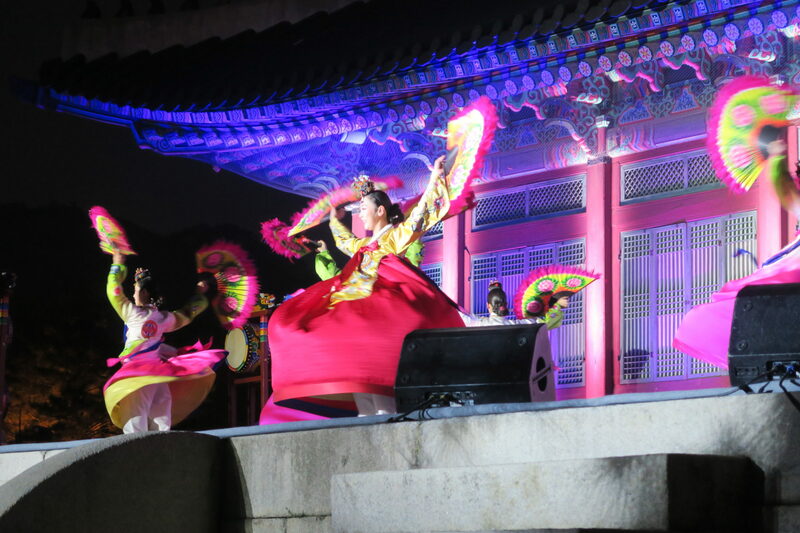 I happily snapped away at the beautifully choreographed movements wishing I could have understood the Korean introduction given to the dancers. All the while, my stomach was complaining louder at being ignored. So, when the dance finished I reluctantly decided that I had to get something to eat. The show was still going but I was famished! Looking around the area, there was absolutely nothing. No cafes, restaurants or even a vending machine. I was clearly unprepared for this. Disappointed, I decided I had to go. By this time, it was dark but the palace came alive with it’s own night lights. There’s in fact even more visitors now as locals came after work to enjoy the show and the palace at night. 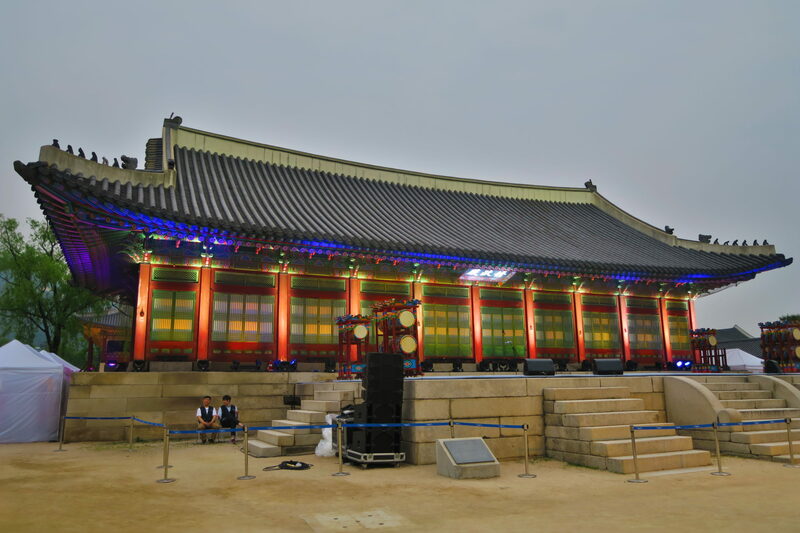 The main Throne Hall or Geunjeongjeon I mentioned in my last post looked even more colourful. These two young Korean ladies allowed me to take a photo of them in their traditional costumes! Then it was really time for me to head back out to find a restaurant. 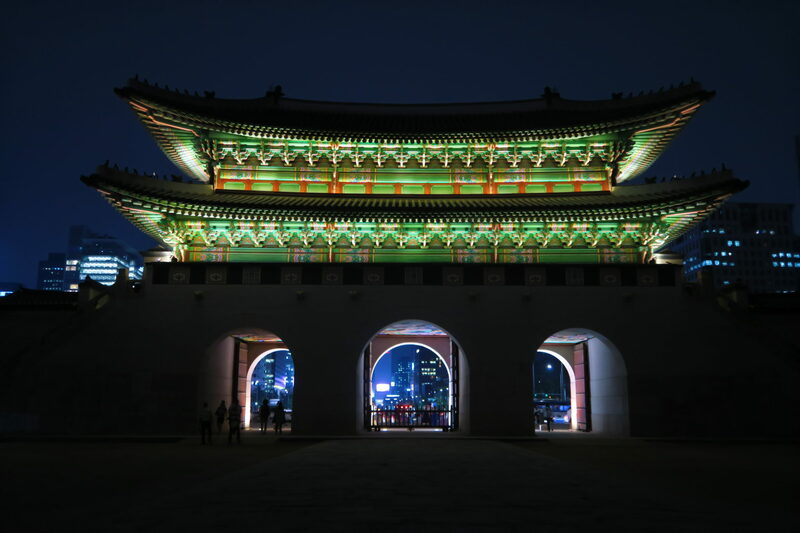 So, it was back out towards Gwanghamun Gate which by now was lit up in emerald green colours. Just beyond that, it is Seoul city.